Some folks are already grumbling at the gym because parking lot is too small. They're running out of space. Try running to the gym, instead of running your vehicle. When I run past the gym, while running my errands, I see folks running on treadmills. They claim they can't run to the gym, else they'd run out of time. I don't make it to a treadmill since I run into so many interesting people in the locker room. It's an ongoing conversation. Topics run the gambit from politics to confessions. Locker room can be more enlightening than a bar where they run too many watts through those ear shattering amplifiers. Before Washington State banned smoking in the nightclubs, it would make my eyes run. Smoke used to run me right out of those places. For dancing, I would rather run to aerobics where the music is kinder. That's still not a treadmill. 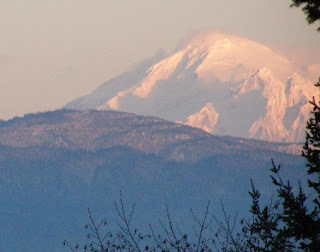 Running, or actually jogging and walking up Sehome hill, Mount Baker greeted me via the zoom lens.